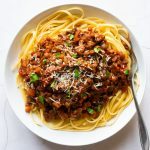 Filled with vegetables, this vegan spaghetti bolognese is rich, healthy and of course, tasty! Heat a large saucepan or casserole pot to medium heat and add the oil. Add the chopped carrot, celery and onion to the pan. Saute for 8-10 minutes until the vegetables are soft and are beginning to turn translucent. Throw in the mushrooms and saute for 5-7 minutes until the mushrooms have released some of their water, then add the garlic and saute for 2 minutes. Add the red wine and soy sauce, bring to a boil and then reduce the heat to a simmer. Cook for 5-7 minutes until the liquid has reduced by half. Add the tomato puree and stir it in then add the chopped tomatoes, vegetable stock and bay leaves. Simmer for 25-30 minutes until the liquid has reduced and the sauce has thickened. Add the lentils and cook for a further 5 minutes to warm through. Then season with salt and pepper to taste. Cook the spaghetti as per packet instructions. Serve the spaghetti in a bowl topped with spoonfuls of the bolognese sauce. Top with Parmesan and enjoy!